Hi! My name is Rudy. I don't remember much about what happened before I ended up at animal control, but I remember that I was roaming around in a field, looking (with my not-so-good eyes) for food, when the dog catcher came and scooped me up. I was so thankful to have someone to care for me, that I didn't realize where I was going. He put me in a cage in the back of a big truck, and took me to Baldwin County Animal Control in Summerdale, Alabama. I stayed there for a couple weeks, sleeping on the cold cement in my run. It was a very scary place. One day, my friends and I overhead the humans talking. They were saying that my time was almost up! Now, you have to understand... I'm an old man. The humans think I'm somewhere between 9 and 11 human years, which is very old in dog years. I'm so skinny, because I hadn't been able to eat very much out there on my own, and I'm almost blind. I have all this gook in my eyes and these things growing under my skin. So, you see, no human would come to see me and take me home with them. 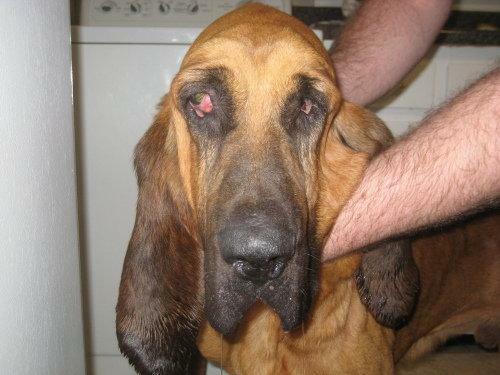 Who would want an old, bony, almost blind bloodhound? I'm not sure what all happened, but a couple days later, a nice man came in and talked to the humans for a little while. They kept looking my way, and I thought they were talking about me, but I wasn't sure. Why would he want to take me home? Well, the next thing I knew, I was in his car riding down the road! We rode in the car for a long time, until we got to Birmingham (which I think is about 4 hours away), and we met another lady, who I rode in the car with for a little while. She took me down the road to meet another lady, and to see a doctor. It was kinda scary at the doctor's office, especially when they cut my toenails, but they loved on me and gave me food and medicines for my eyes! They also said I have worms in my heart. My human, now, says that once I get fat again, we can try to fix my eyes and those things growing under my skin. And, maybe even get rid of those worms in my heart! I surely thought I was a goner, but thank goodness I was wrong, and I am wanted. I am going to be loved and spoiled for the rest of my life.